Webinar lead follow-up is an important part of a balanced marketing-to-sales hand-off. And since "the best place for dramatic improvements in business performance [is in] the hand-offs between functions," (Jon Miller, Co-Founder, Marketo) there's a decent chance you stand to benefit from optimizing your follow-up. 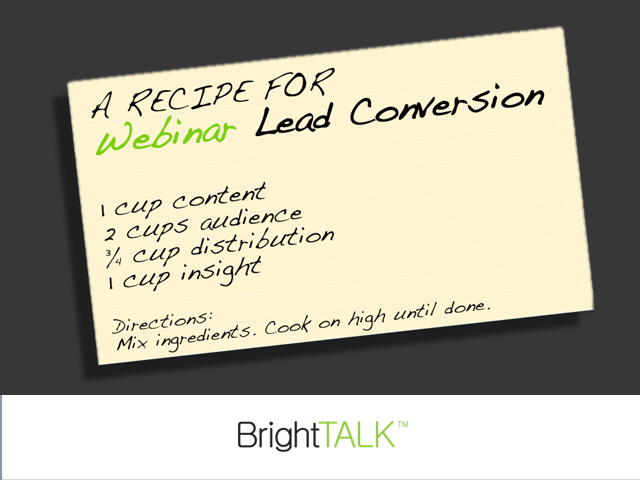 Join BrightTALK's David Kreitter and Andrew Bellis as they discuss how BrightTALK's Demand Generation team is cooking up hot leads for a global sales team, and how both sides are driving conversion rates with a closed-loop lead processing methodology.